Saturday, 22nd April 2006, we had a look at what could be done to "The Ho" to get it back into shape. The passenger side wing was pulled out a bit using the winch on Andy's Polaris 4x4 and using a pair of crowbars we managed to bend the door panel back out which allowed the electric windows to work freely again. The shocker came when we looked at the front suspension - no pun intended. 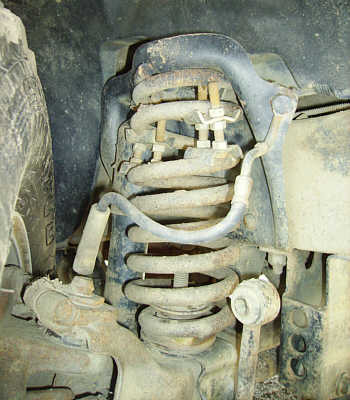 The front driver's side coil spring top bracket at rusted, broke and bent which caused the spring to come out on the last trip. The spring spacers we put in aren't helping as with the spring loose they've moved putting more pressure on the spring. Oddly enough, when we checked the passenger side the spring and bracket look in excellent shape. It looks like I'll be touring the scrapyards looking for one of these brackets but as they are riveted in I expect I'll have to ask them to cut out part of the frame for me. We don't know what caused the corrosion under here. It may be salt. 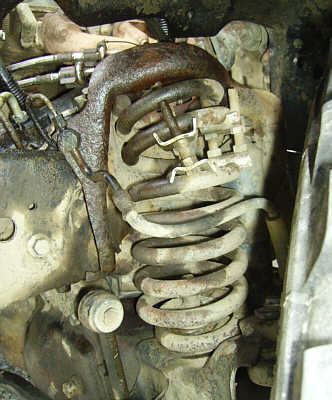 The wetness is from the leaking power steering fluid, but that shouldn't cause this. Above the spring mount is the valve cover that was recently replaced, also due to corrosion. We also don't know how we managed to miss this as going back through some of the photos I took, it looks like it was noticeable at least around 9th April. 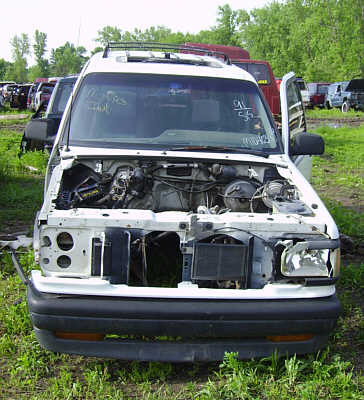 28th April 2006, and I went to Bud's Auto Salvage, Walnut Place, West Terre Haute to see what they had. 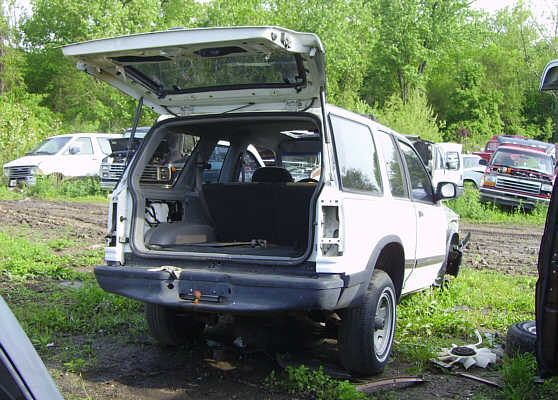 I came across a 1992 Mazda Navajo and looked around what what salvageable from it. 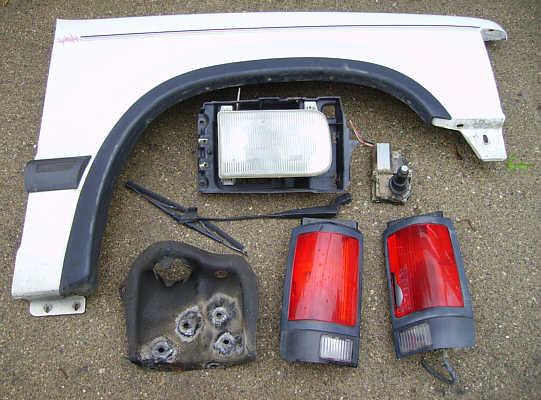 In the end I picked up the driver's side spring bracket, rear wiper motor and wiper, both taillights, passenger side headlight and passenger side wing (fender) for which I paid $249. Looking at what I bought this seems expensive but it's a lot cheaper than buying new. What I also wanted was the front grille but someone had already removed the engine and wrecked the grille getting it out. Parts of it were still attached to the headlight though and that's what I wanted and needed. The really important part was the spring bracket and the scrapyard simply ground the rivets off to get it away from the frame. It would have been ideal if I could just have them salvage the important pieces which are most likely to get damaged in the future, like the window glass, mirrors, axles etc. and for me to take them away and store them but even from a scrapyard the sum of the parts is far more than the value of the whole.